I’ve known Christina Stembel since her early days of Farmgirl Flowers. I used to say hers was the one business I regretted not being able to include in my 2012 book The 50 Mile Bouquet, because by the time we first met, virtually, through an email introduction, I had already finished writing and my publisher St. Lynn’s Press had already wrapped up the book’s production and sent it off to the printer. When preparing this intro, I wanted to actually go back and figure out how Christina and I met, and as it turns out San Francisco-based food writer Sophia Markoulakis virtually introduced us by email on January 29, 2012 — about six weeks before the publication of The 50 Mile Bouquet. I knew that timing was close, but had completely forgotten about Sophia’s introduction. Sophia quoted both Christina and me in a February 7, 2012 article for the San Francisco Chronicle, titled: “Locaflores? Eco-friendly florists think locally”. It’s just amazing to look back six years ago to the date of Sophia’s article, and consider all the strides we’ve taken to promote local, seasonal and sustainable flowers. Christina appeared on this podcast as an early guest on Episode 108 in September 2013, and subsequently we recorded Episode 154 in July 2014 from Homer, Alaska, so longtime listeners of the Slow Flowers Podcast are familiar with her story. 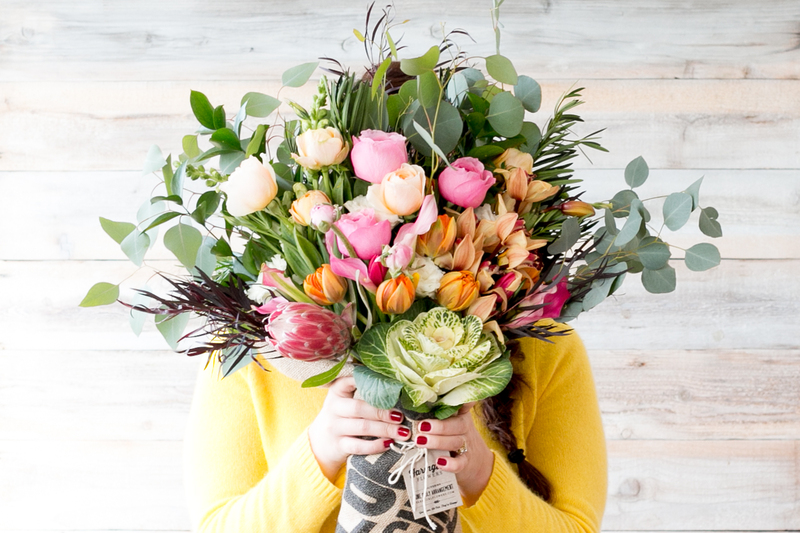 “Farmgirl Flowers’ founder Christina Stembel is not a typical Silicon Valley start-up darling. She isn’t backed by venture capital firms who have ponied up millions of dollars to fund her launch; she doesn’t have slick office space where the staff get to play ping-pong or video games after grazing on catered vegan lunches. She drives a hand me down car and lives in a rental house with her husband Neil Hiltz. 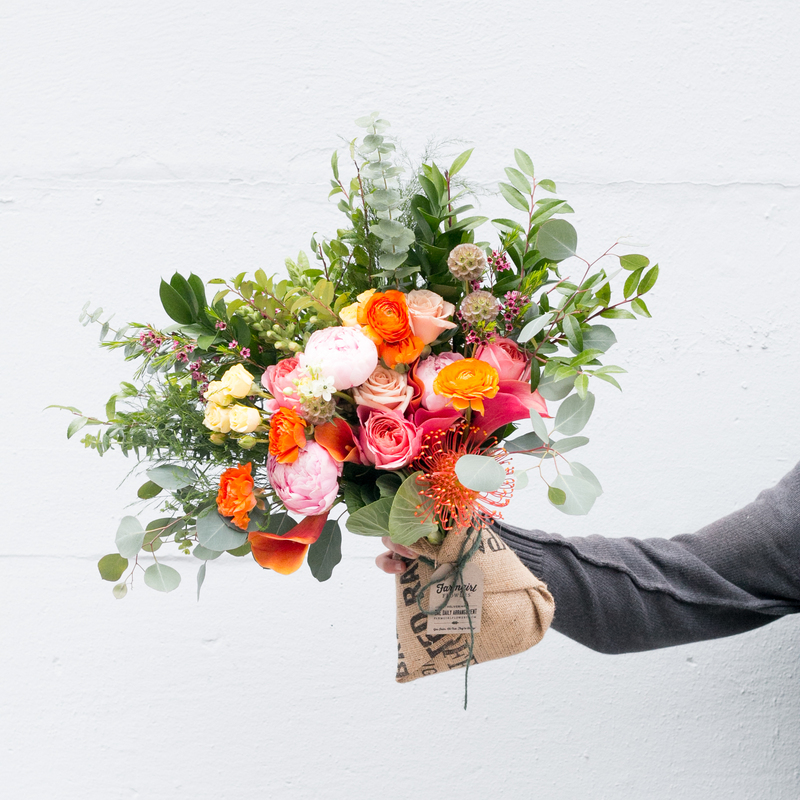 In the Q&A that followed, Christina spoke openly about the challenges of growth, including one of the most difficult ones that she faced a little more than a year ago — that of finding enough flowers to keep her customers happy. 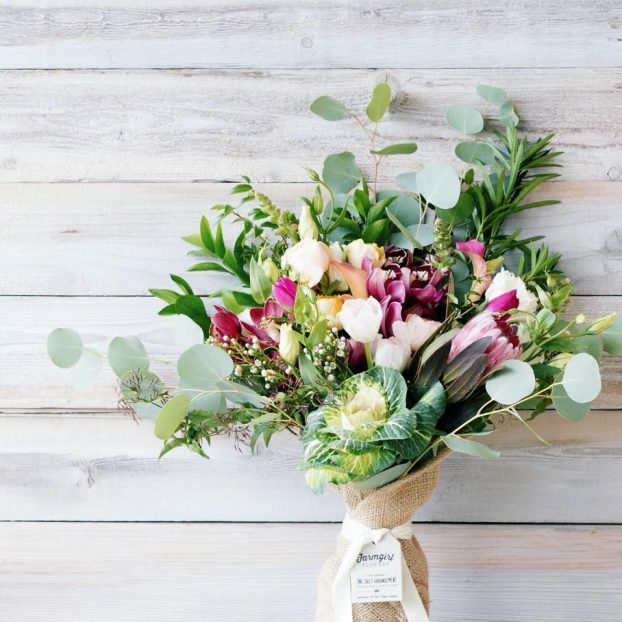 FR: Earlier this year you announced to your customers and followers that you were going to begin sourcing flowers from outside the U.S. You posted a letter on your web site called “Our Heart” that explained your decision and what it meant to you and your team. You explained that you were faced with a challenge of sourcing enough flowers from domestic farms and that Farmgirl will now “source directly from farms abroad whose values align with our own.” And you said, “We will continue to buy the majority of our flowers from US growers (at least 80% right now), and will be subsidizing with flowers we can’t get enough of here.” What has the response been to this announcement? I asked Christina to join me again today to reflect on the past year of transition for her. One of the other reasons for this interview is to discuss the pain of growth and how all successful companies evolve due to unexpected market forces. I was particularly moved to ask Christina to appear on the Podcast again after yet another round of comments that flooded Facebook groups, mostly populated by U.S. flower farmers, after a recent Forbes article about Farmgirl, which was published last December. Here is a link to Christina’s “Our Heart” letter, which appears on the Farmgirl Flowers web site. Farmgirl Flowers’ branding is some of the best in the industry. I have to be honest — I was confounded by the number of assumptions and accusations being made about Christina in social media forums, and the conclusions to which people in the industry jumped, standing in judgment of a woman who has done incredibly amazing things to elevate the awareness of local flowers in our popular culture. At one point, Christina weighed in and offered to return to the podcast — and others on one of the threads were in support of it. What you are about to hear is an honest conversation between two friends. I simply can’t be impartial and I make no apologies for it. It saddens me that people are critical of Christina’s choices. 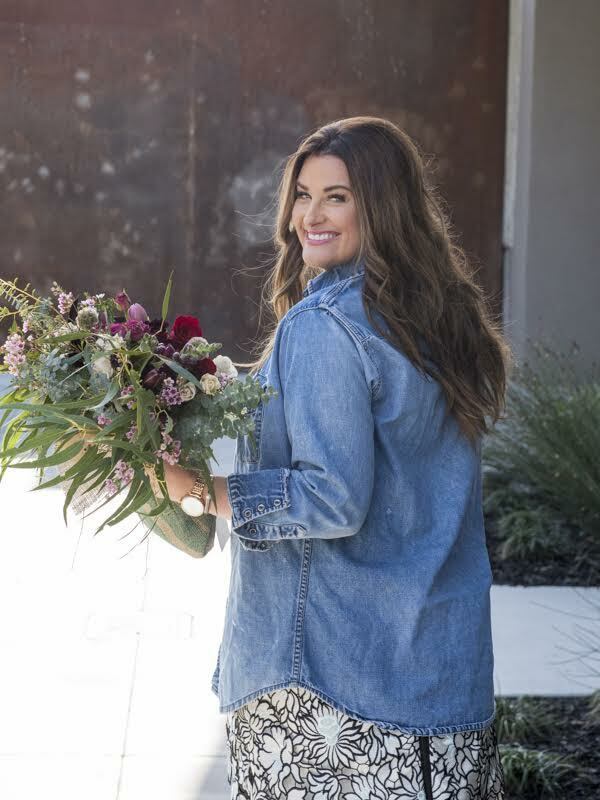 She speaks honestly about how tough those choices are and reveals, in fact, that she is still spending millions of dollars annually to buy American grown and local flowers for Farmgirl. I hope you listen closely with an open mind and heart. While you may not agree with Christina’s choices, I think you’ll definitely learn from her tenacity and big heart. Thanks for joining me today! I am grateful to Christina to opening herself to this kind of scrutiny and explanation. I respect her for even trying to set the record straight and sharing some insights into her decisions. 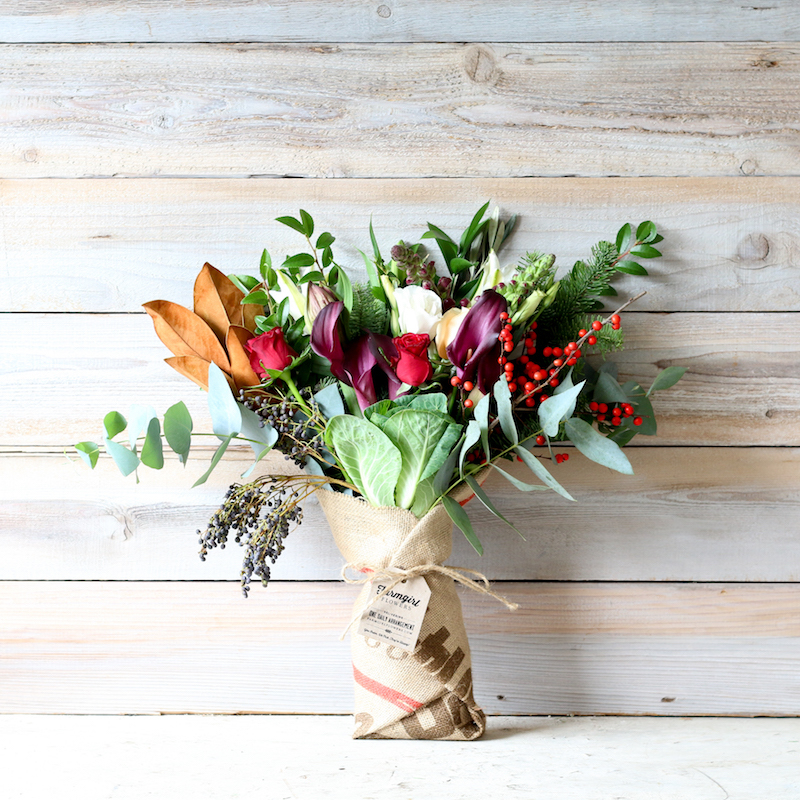 Check out the beautiful USA-Grown Bouquet from Farmgirl Flowers, starting at $75 plus shipping. If you have more to say, please say it to her directly rather than in a public forum like Facebook. She has offered up her email at farmgirl@farmgirlflowers.com and I know she will answer any respectfully posed questions with sincerity. Despite my personal mission of changing the floral landscape through Slow Flowers’ outreach, promotion and content, I have also acknowledged that imports are here to stay. Yet, if we can even move the needle by a few percentage points away from the 80 percent import-20 percent domestic ratio, I will consider this movement a success. I’m well aware of the compromises many feel they have to make sometimes to stay in business. The flower shops that have a secret stash of floral foam in the back room; the designers who don’t want to say “no” to a customer’s request for white hydrangeas from South America in January; the flower farmers who run a side gig with a farm in Baja. Don’t kid yourself. Not everyone is doing it but it happens. I was recently called out for leasing a Honda and slapping my “SlowFlo” license plate on it, or I’ve faced a crummy decision when the hard goods wholesaler where I shop runs out of USA-made glass vases and I’m forced to substitute with imported glass from China because I didn’t plan ahead. Degrees of sustainability face us all. Let’s focus on what we’re doing that’s positive and continue to uphold, support and encourage one another to be transparent and honest in our actions. Cooperation over competition is the phrase I often hear. I’m hopeful you will receive this podcast today in that spirit. If you’re able to attend the 2nd annual Slow Flowers Summit, coming up, June 29th in Washington, D.C., you’ll hear from Christina who will serve as our keynote speaker! 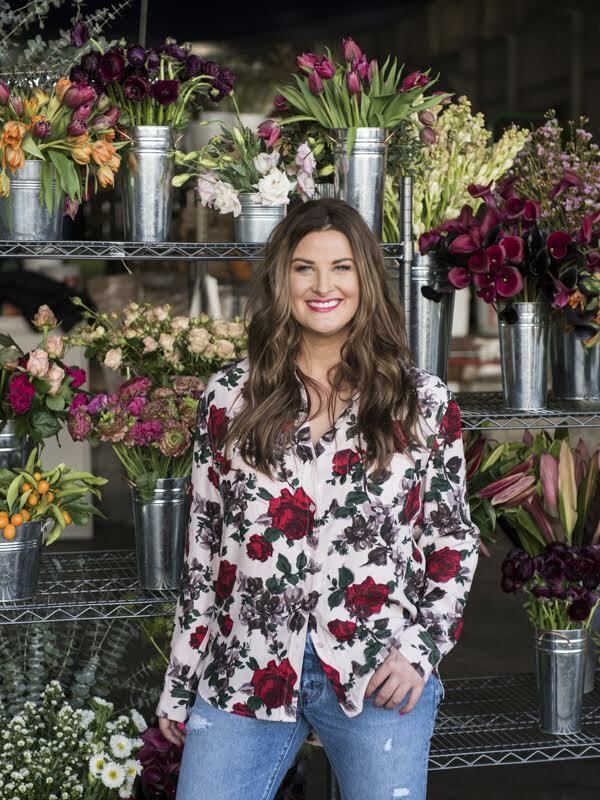 Her presentation, “Scaling Your Floral Business to the Next Level,” will share great insights for floral professionals at any stage in their journey. Please visit the show notes for this podcast to find all the links and details to the Slow Flowers Summit. I’ll be featuring our speakers and more event details in the coming weeks. The Slow Flowers Podcast has been downloaded more than 280,000 times by listeners like you. Thank you for downloading, listening, commenting and sharing — it means so much. 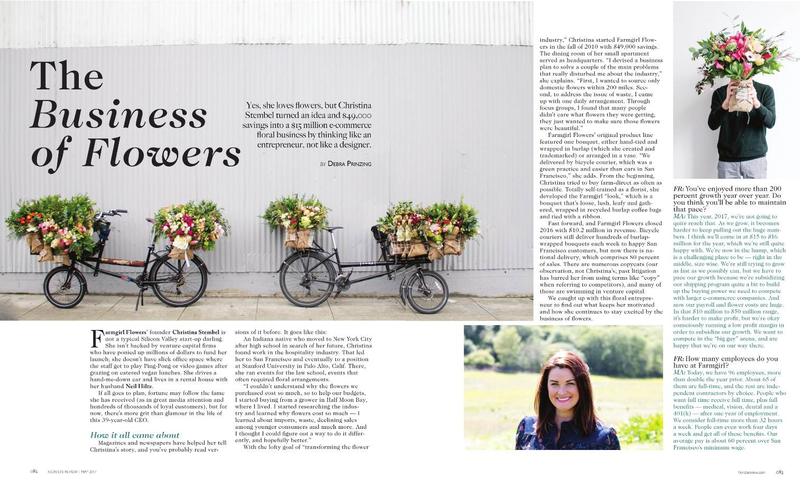 Florists’ Review magazine: I’m delighted to serve as Contributing Editor for the new monthly Slow Flowers Journal section, which you can find in the pages of Florists’ Review. It’s the leading trade magazine in the floral industry and the only independent periodical for the retail, wholesale and supplier market. 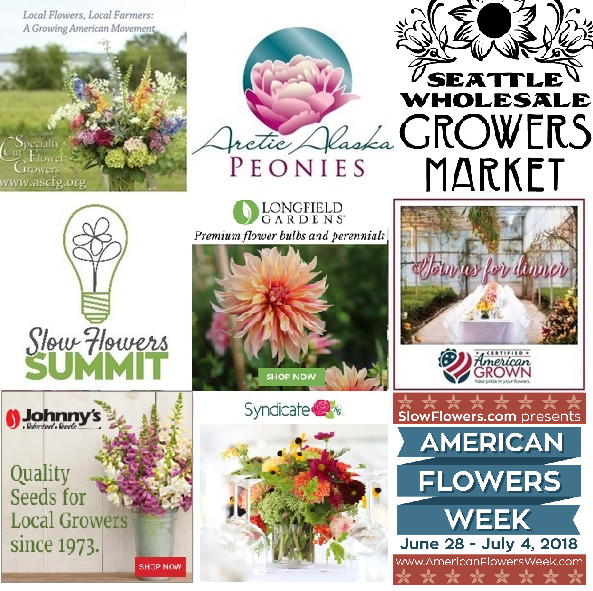 This entry was posted on Wednesday, February 7th, 2018 at 11:14 am	and is filed under American Grown, Blog Posts, Creativity, floral design, Flower Farming, General, Podcast Episodes, SLOW FLOWERS Podcast, Slowflowers.com the Directory of American Flowers, Storytelling. You can follow any responses to this entry through the RSS 2.0 feed. You can leave a response, or trackback from your own site. Thanks so much for sharing! As a baby businesswoman and small flower farmer I have admired SlowFlowers and Farmgirl Flowers from a far. Christina is an inspiration to me as a woman and a business owner! Rock on! Thanks for your comment, Jessica! I’m so pleased you’ve admired Slow Flowers from “afar.” Now is the time for you to join the community and support the Slow Flowers Movement as a member! We’d love your involvement and we need more representation in states like yours! You can join by visiting slowflowers.com.